Two figures gaze outwards (while one of them beckons toward the viewer – Alberti would be so pleased!) 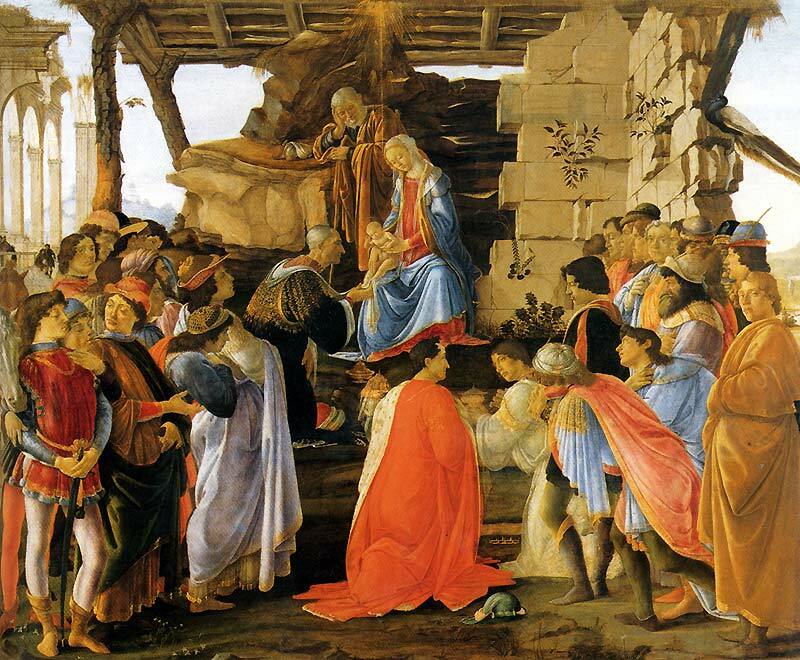 in Ghirlandaio’s Adoration of the Magi (1488). 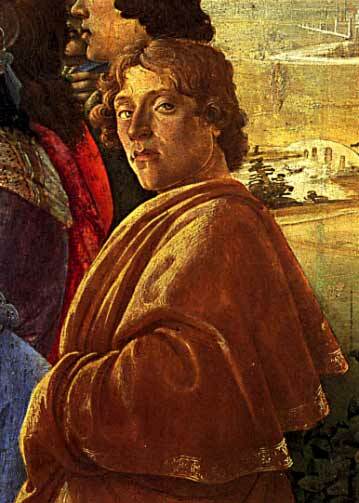 The staring figure near the top of the detail is a supposed self-portrait of Ghirlandaio. I think it’s interesting that so many painters decided to include themselves as the token “communicating figure” within their paintings. 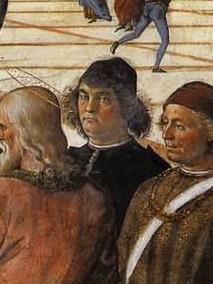 The examples by Ghirlandaio, Botticelli and Perugino are a small sampling of the staring/communicating self-portraits which exist. (To give you an idea, other such self-portraits were done by are Jacopo Pontormo (see here), Raphael (see here) and Fillipo Lippi (see here and here). But, the more that I think about it, the inclusion of the self-portrait is very fitting for historia painting, particularly when considering Alberti’s thoughts on communication. After all, if at least one figure is responsible for communicating to the viewer (and drawing the viewer into the scene), shouldn’t that figure be the artist?!? Makes sense to me. What about you? What paintings do you enjoy where a figure is staring outwards at (or beckoning toward) the viewer? 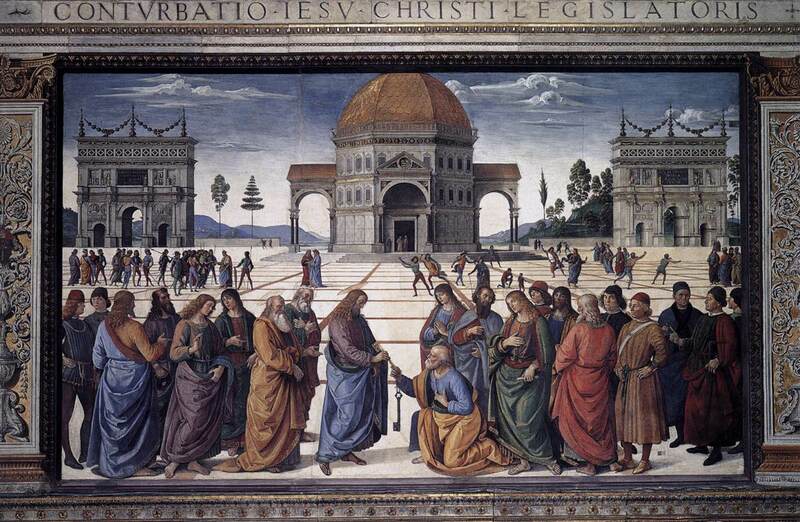 I know there are tons of them out there – especially from the Italian Renaissance period! 3 It should be noted that many painters followed Alberti’s advice by including a figure in communication with the viewer, but not directly looking at the viewer. For example, Ghirlandaio’s Adoration of the Shepherds (1485) shows a shepherd who is pointing (to communicate with the viewer), but the shepherd’s gaze is toward another figure in the painting. Super post M! I love the viewer directed glances from within paintings – there is something very personal and touching about it – especially when it is believed to be the artist themselves. Funnily enough, he writes his name on his hat so you can easily pick him out! I have three favorites. Number 1 is naturally Giorgione's Tempest where the Woman looks out and virtually invites the viewer to enter the picture. On the left, exactly where Alberti would have placed him, is the Man acting as an "interlocutor" directing our attention to the Woman and Child. Number 2 is Bellini's "St. Francis in the Desert" where the tree on the left acts as an interlocotor and bends toward St. Francis. Number 3 is Titian's "Pesaro altarpiece" where all the figures are looking in different directions for different reasons. The boy on the right who looks our at the viewer has been identified as the only male heir of the family. If you view this altarpiece on site in the Frari, the eyes of the boy look directly at you no matter where you stand. Good luck on your lecture. 1. Titian's Venus with a Mirror, where Venus seems to look towards us with the help of the mirror. 2. Rembrandt's Night Watch. A number of candidates, but for me the most memorable one is the fragment of a face / eye seen behind the shoulder of the standard bearer. 3. Fragonard's The Swing, where the statue representing "discretion" plays this kind of editorializing function, even though he doesn't look at us. 4. Manet's Olympia, where (famously!) her direct gaze turns the viewer into a potential client. And also look at the black cat. I love the examples that everyone gave! H Niyazi, I think you're right: there is something very personal about having a figure gaze at the viewer. Alberti said that he wanted to move the viewer with historia paintings, and I think that such a personal connection also can help the viewer feel connected/moved by the work of art. Dr. F, your example of Bellini's tree was interesting. The tree does help to draw you into the scene – even if it isn't the traditional type of (human) figure that Alberti implied in his treatise! Well spotted! And I loved your miniature example, by the way. That's too funny. Your Titian example with the mirror is also really interesting. Boy, one could do a lots of analysis with that painting (e.g. Lacan's mirror, the issue of spectatorship, etc.). What fun stuff. Thanks for sharing. I love this blog,M. I learn something each time I read a post and usually take away something interesting to ponder and/or process. As you know, I am not an art historian, but I love art. I usually do not comment, but want you to know how much I learn here.